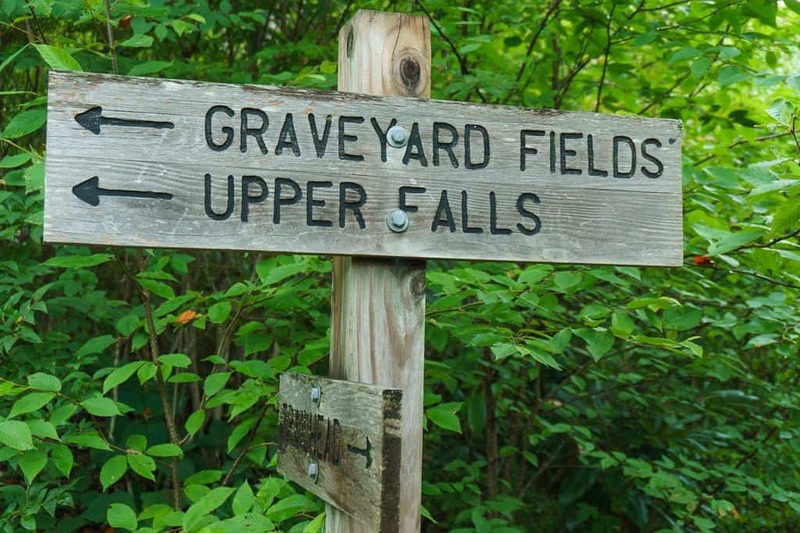 You may be wondering about the name Graveyard Fields. It comes from the appearance of the landscape after logging and fire destroyed much of the forest and soil: the tree stumps left behind looked like gravestones. The hike visits two beautiful waterfalls, the multi-tiered second falls and the tall cascades of the upper falls. The trail winds through a stream-filled valley filled with wild blackberry and blueberry bushes that burst with fruit in the late summer months. Graveyard Fields makes for one amazing, unforgettable hike. A map at the parking area shows the Graveyard Fields trail system. The set of steps to the right of the map is the start of the trail. After crossing the bridge, the main trail goes left and upstream. A 0.25-mile trail to the right will take you to the bottom of the Lower Falls, which is a moderate descent. Be careful the rocks around waterfalls are very slippery. The main trail will take you through open, grassy areas, and past nice pools for wading on a hot summer day. After one mile, you will see the trail to the Upper Falls. The main trail crosses the Yellow stone Prong and returns to the parking lot. Directions: This trail begins at the Graveyard Fields Overlook on the Blue Ridge Parkway. From the U.S. Highway 276 junction with the parkway, turn left or south on the Parkway and continue to milepost 418.8 (about 6 miles).